China's recent move to slash its holdings of US Treasuries and the country's reduced foreign currency reserves are normal phenomena and are unlikely to lead to a shortage of foreign currency despite warnings in some overseas media reports, domestic experts noted on Saturday. According to a Bloomberg report on August 27, the People's Bank of China (PBC), China's central bank, has sold at least $106 billion of reserve assets, including US Treasuries, in the past two weeks. The PBC cut its holdings of US Treasuries and bought yuan to support China's currency following the devaluation in mid-August, Bloomberg reported, citing unnamed sources. Currently, China controls about $1.48 trillion of US government debt, the Bloomberg report noted. Some overseas analysts have pointed out that at China's current pace of foreign currency consumption, the country would run short of foreign currency reserves needed to support the yuan's exchange rate by the end of this year, a report by People's Daily noted on Saturday. According to a statement from the PBC on July 14, China's foreign currency reserves reached $3.69 trillion by the end of June. This was the lowest level since 2013, the People's Daily report noted. Hu Yuyue, a professor at Beijing Technology and Business University, told the Global Times on Saturday that selling US Treasuries is a "normal choice" for the authorities. "The price of Treasury bonds is inversely proportional to banks' interest rates. Therefore, as the expectations for an interest rate rise in the US grow higher and higher, the price of US Treasury bonds is likely to fall in the near future. That's why China needs to sell the Treasuries in advance," Hu noted. 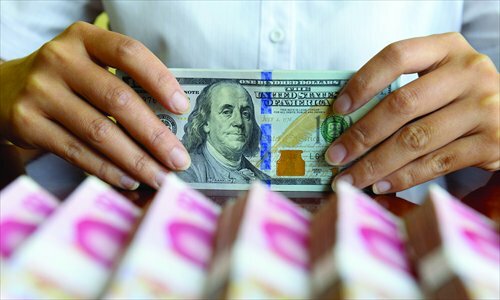 However, the sale of US Treasuries and the fall in foreign currency reserves do not necessarily mean that China will soon face a shortage of foreign currency reserves, according to a report by domestic finance information website finance.qq.com on Saturday. The report said that based on IMF criteria, China should have foreign currency reserves of at least $2.6 trillion. On this basis, "the figure of $3.69 trillion in reserves is a sufficient amount," the report said. Huang Guobo, an economist at the State Administration of Foreign Exchange, said that the standard for an appropriate foreign currency reserve scale is "very hard to define," according to a post on the central government's website on June 12, 2014. Hu also noted that having excessive foreign currency reserves could harm the domestic economy. "For any amount of foreign currency reserves, the PBC has to release an equivalent amount of yuan into the markets. Therefore, too much foreign currency reserves would increase the risk of inflation," he noted. Hu also said that selling US Treasuries could improve China's foreign currency reserve structure, as it would reduce China's reliance upon the US dollar. Therefore, Hu noted, the cut in foreign currency reserves is merely an "adjustment strategy." But the central government may take measures if the foreign currency reserves drop too fast, he said. Tan Yaling, dean of the Beijing-based China Forex Investment Research Institute, told the Global Times on Saturday that China's sale of US Treasuries has had a limited effect on the yuan's fluctuating rate recently. The yuan has fluctuated greatly in recent weeks. On August 11, the PBC allowed the yuan to depreciate by about 2 percent against the US dollar, the biggest one-day devaluation of its currency in two decades. "The most fundamental reason for China's recent currency rate fluctuations is the country's economic transformation. China has stepped into the 'new normal' period with slower economic growth, which has been demonstrated by weaker economic data recently," Tan said, noting that a weaker yuan will help stimulate exports and could be helpful in boosting domestic economic growth.